My husband and I had a bit of a shock last year when he unexpectedly lost his job after 15 years. It created a great deal of worry and meant a lot of hard changes for us since our income was cut so drastically. But like with all things, time brings perspective. Now it’s 6 months later and I’m able to see the many positive outcomes. One is that he’s going full steam ahead on a new career that makes him happy. Another is that I’ve started shopping and cooking differently, with more of an eye to affordability. I now approach these weekly tasks from a different angle and find it quite satisfying to get what we need for the lowest price; once you’re in the habit of being a bargain hunter, it doesn’t seem that hard. We decided a long time ago that healthy eating was a priority for our family, and we didn’t want to give that up, even temporarily. I also know that it’s a common belief that healthy foods simply cost more. So, my goal was clear: get by with less money while still serving delicious, nutritious meals. With fewer monthly shopping trips and a tight grocery budget, I’ve become even more reliant on meal planning. But, I’ve also gotten better at throwing together a dinner without a plan by just pulling together what I’ve got into something edible. This is especially true as I try to eek out a few more meals from the same lot of groceries. Since I’ve been honing my “best practices” and refining my list of “favorite foods” for a while now, I thought it made sense to share my top 10 pantry staples. Healthful canned foods enjoy some good real estate in our pantry. 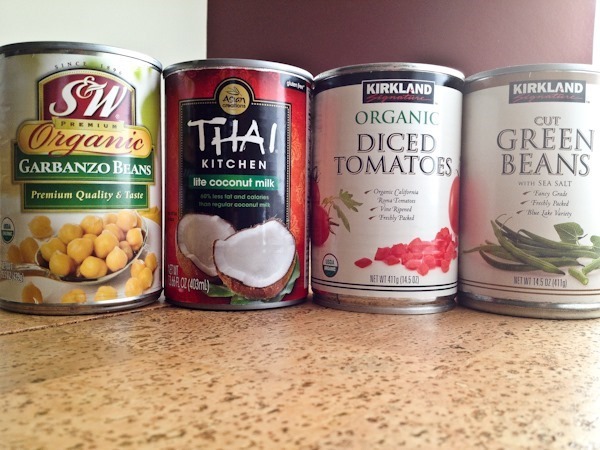 My regulars are coconut milk, tomatoes, green beans, and a variety of other beans like black and garbanzo. Of course the worry about some canned foods is that they’re high in sodium, but you can get varieties with no salt added and studies suggest that draining and rinsing them can reduce the sodium content by about 10-40%. Canned foods have some perks, too. They allow us to enjoy our favorite vegetables year-round and they have a long shelf-life, so it’s OK to stock up when they’re on sale or buy them by the case. And I think with canned foods especially, opting for the store brand instead of the national brand is a great money-saving tip. 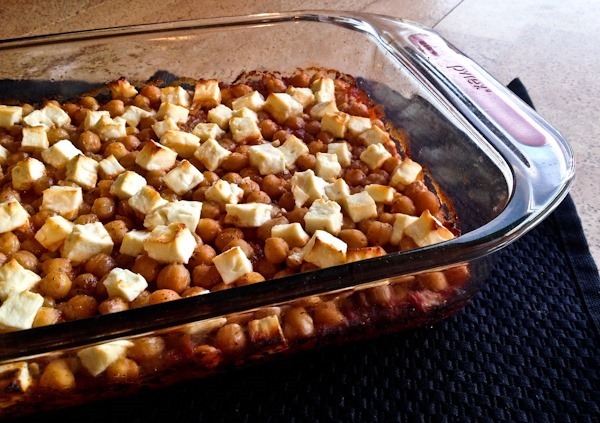 Mark Bittman’s Baked Chickpeas with Fresh Cheese in a Spicy Indian Tomato Sauce (using coconut milk, garbanzo beans, and tomatoes) From his book How to Cook Everything Vegetarian or his app of the same name. While canned beans are convenient and nutritious, dry beans are usually cheaper. (You can’t get many protein-rich foods into your cart for less than $1.50/pound!) I keep pinto and black beans on hand, but my favorites are mung beans and lentils since they don’t require soaking ahead of time; they cook up from dry in about 20-30 minutes. If you’re new to mung beans, I’d suggest this recipe from 101 Cookbooks. In the summer when the cucumbers and herbs are fresh, it’s divine: Lemon Cucumber Tofu Salad. I would say most of our dinners rely on some type of whole grain, like bulgur, brown rice, barley, whole wheat pasta, or whole wheat couscous (but this can sometimes be hard to find). Scooping from the bulk bins or buying bulk-sized packages are usually the way to go for the best price, but I must admit, when we buy the 10 lb. box of oatmeal at Costco I feel a bit like a Doomsday Prepper. 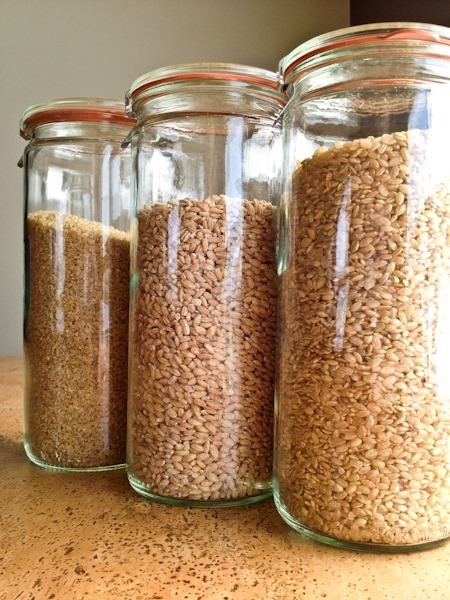 The recommendation from the United States Department of Agriculture is for at least half of your grain choices to be whole grains, so you don’t have to avoid refined grains or white stuff entirely. My favorite compromise is to mix half white rice and half quinoa in my rice cooker. It comes out light in texture and color, which can be more appealing to some kids and adults, but it’s still got 50% whole grain. This works economically, too, since quinoa can be more costly. Bulgur wheat, barley and short grain brown rice. The challenge with most whole grains is that they take longer to cook. But there are ways around this. If I’m in a hurry, I’ll use whole wheat couscous; if I’m not, brown rice. The goal to eat more whole grains also extends to the flours I keep around for impromptu baking. I use whole wheat flour to make homemade naan bread, dinner rolls or loaves of sandwich bread, and whole wheat pastry flour for pancakes and muffins, but I’ve been experimenting with buckwheat and oat flour lately, too. There are different methods for preserving fresh foods so they’ll last for months, and the drying process works especially well for fruit. So they’re a handy way to get antioxidants without relying exclusively on the seasonality of fresh fruit and they are great pantry staples. We make sure never to run out of dried tart cherries, currants, or cranberries and we add them to hot cereal, granola, and all kinds of lettuce, grain or vegetable salads. We make this Vegetarian Times salad but replace the millet with another whole grain of choice (usually quinoa) and sometimes use dried cherries in place of the cranberries: Warm Salad of Millet and Roasted Brussels Sprouts with Cranberries and Walnuts. I’m not the first to tell you you’re supposed to eat more vegetables, and that fresh is always best. But, I like to enhance my overall intake by using fresh along with some convenient frozen options. Edamame, super sweet corn and petite peas are our standards, and we use them in soups, casseroles and succotash. Since they’re processed soon after harvest, frozen vegetables and fruits retain a lot of their nutrients. Depending on the particular fruit or vegetable, they can have more beta-carotene and vitamin C but be lower in polyphenols and anthocyanins (these are both healthful substances in plant foods). So I think frozen is a reasonable substitute when fresh isn’t available or is too expensive. I feel the same way about frozen fruit, and I keep a large reserve available for my morning smoothie habit. My much-loved favorites are raspberries, strawberries, mango and cherries and I find regular opportunities to use them all in muffins or salads or on top of frozen whole grain waffles when we have breakfast for dinner. Freezing your own berries in the summer makes a lot of financial sense and I freeze my own bananas and avocados for smoothies, too. Freezing foods is a great strategy for savings leftovers for another meal later in the month, or taking advantage of large quantities of seasonal fruits and veggies when they’re available at a lower cost. Right now we live in a condo and are limited to the 4 cubic feet of a standard freezer-on-top refrigerator, so space is at a premium. 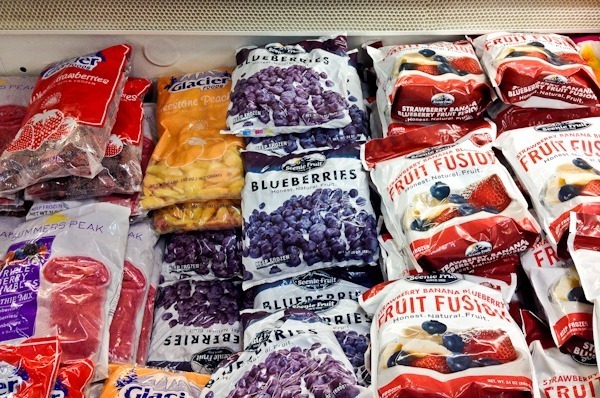 My dream is to one day have a dedicated chest freezer so I can fill the 20 cubic feet with colorful, fiber-rich, budget-friendly frozen goodness. Cheese lives in the refrigerator, so I suppose it’s not technically a pantry staple, but it’s a staple in this house nonetheless. I rely on Costco for the best price on 1 lb. Parmesan and 2 lb. sharp cheddar, which are our two favorites. Controlled amounts of cheese are a fairly common ingredient in our vegetarian meals and we always manage to use up the bigger bricks before they go bad. There are a handful of fresh vegetables that I consider pantry staples because they last for so long. I now buy potatoes, onions, and carrots in the big bags to get a better price, and rely on them for weeks, here and there, in our favorite recipes. A recent trip to the Grocery Outlet left me with some fresh foods and some pantry staples, all at good prices. Talk about convenient. The use of shelf-stable aseptic boxes for non-dairy milk means you can buy 12 quarts at a time, for a better price, and it will last for months. I know a there are a lot of folks out there concerned about soy, and while I’m not one of them, I think nutritionally it makes sense to have variety. Soymilk is much higher in protein and almond milk is often lower in calories, and the other popular non-dairy milks, like rice and oat, vary somewhat. So, we rotate. We buy by a case of one, then a case of another the next time, and so on. We go through a lot since we use it in smoothies, soups, sauces, and baking. This last one is a bit of a catch-all, but so important. I’m able to make my pantry stapes come together as tasty meals because I keep some basics on hand that are full of flavor. I also try to buy these at the best possible price which usually means a larger container. But I store nearly all of them in the refrigerator and they last for what feels like forever. Examples are low sodium soy sauce or tamari, real maple syrup, and a dry cooking wine like Sauvignon Blanc. I also keep a selection of nut butters around (peanut, almond, and cashew) for use in dressings, soups and spreads, along with my favorite veggie broth for soups and stews. Building meals from these affordable pantry staples is one strategy for maximizing your grocery dollars, but there are several other ways to save, too. I learned how to make the most of coupon and shopping apps on my phone to find deals wherever I can. And instead of shopping at the local food co-op and Fred Meyer, I now shop mostly at WinCo Foods which is new to our town, and a whole lot cheaper. I also frequent discount stores like Grocery Outlet, Deals Only and Big Lots to pick and choose some healthy favorites. It’s certainly not a perfect system, as I’m constantly learning and tweaking things (and being tempted by $15 jars of tahini) but it’s worked well for us. As someone who teaches about nutrition for a living, I wanted to prove to myself that healthy eating on a budget is possible, and I have. Recently, a new study actually quantified the price tag for eating well. They found that healthier food patterns cost on average an extra $1.50/day. I think that’s pretty reasonable, considering the immeasurable value of a healthy body, but I’m a dietitian on a mission to do it for even less. 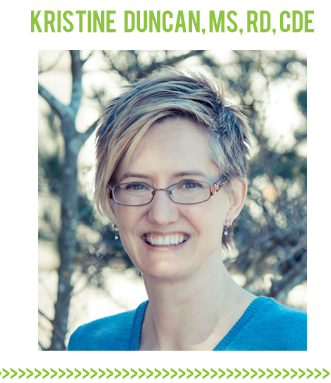 Kristine Duncan, MS, RD, CDE is vegetarian dietitian, adjunct faculty member at Skagit Valley College, freelance writer, and nutrition blogger. What her resume won’t tell you is that she’s also a cat lady, dog lady, and blog reader who longs to travel. She lives in Bellingham, Washington but dreams of moving to Italy someday and getting paid to eat pasta and cheese for a living. Until then, you can find her on Twitter, Facebook, Pinterest and at her blog: Veg Girl RD. 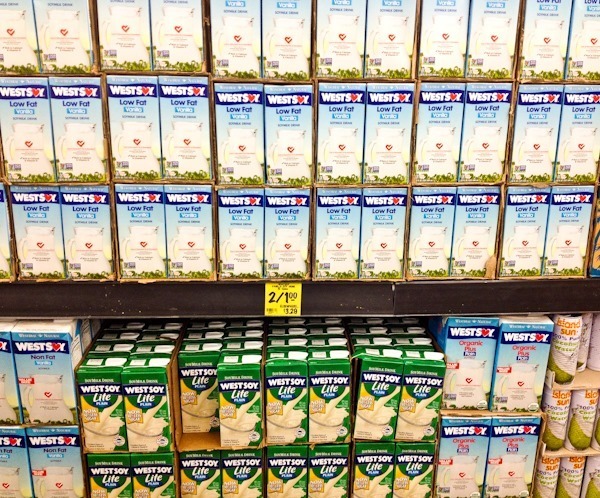 Soy milk 2 for $1! wow! Kristine, I’ve taken to making my own tahini. Just buy hulled sesame seeds from the bulk bin and puree them in a blender or food processor until they turn into tahini. Even my coffee grinder works well. I go through so much tahini that I just can’t spend that much on it. I use it in my homemade hummus and my homemade Whole Foods kale dressing. My version even tastes better than WFs! Such a great idea, Tonya. Homemade is nearly always cheaper…and better! Thanks. Perfect tips! People NEVER believe me when I tell them that fruits, veggies, and other nutritious foods are cheaper per serving than junk food. There is such a wealth of misinformation out there that leads people to believe that only rich people can eat well. Not true! It is cheap to eat well if you follow tips like these. Awesome guest post. Thanks for sharing! Thanks for all the great ideas. We use canned foods in our house too. Do you know what brands are in BPA free cans? I hate that most of them contain that. Also, Pomi sells tomato products in aseptic packaging (like soymilk boxes), and my guess is those would be BPA-free. Heyyy Kristine was my nutrition teacher in college and I’m pretty sure that’s when I became vegetarian! Love the post. Hey Chelsea! Funny meeting you here. 🙂 Hope you are doing well. Thanks for the tips! We like to buy the 20-lb bags of rice – really cheap and lasts for a long time. This was so helpful! As a grad student, I am always grocery shopping on a budget, but often get pulled in my the Whole Foods produce section. I recently got into frozen fruit, but I need to explore the frozen veggies too. So much cheaper. Do you need to refrigerate the shelf nondairy milk after it’s opened? This would save so much money especially with the amour of money I spend on milk because of cereal and smoothies. I love this post! I did one like this a while a back…I found it was very helpful for moms to get organized and also be prepared when making homemade food! I love this! I am currently finding myself really needing to cut back on grocery spending but still wanting to eat healthy. It’s nice to see articles like this out there :-). love this post, and so excited to try out some of these recipes! awesome tips, especially about cooking/storing grains and non-dairy milks. Loved this post! 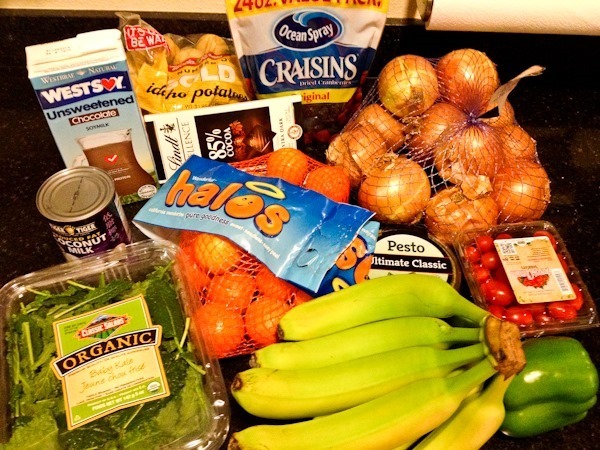 Lots of great tips for me who is trying to eat healthier even when I’m frugal(read…cheap). Great post, with great ideas to try! Thank you! With whole grains like barley and farro etc an overnight soak in water in the fridge, then draining and cooking cuts the cooking time almost in half. Mark bittman’s How to cook Everything Vegetarian is my go to book for great healthy recipes too! Going to a grocery market is just one of my stress reliever, I only go to the grocery once a week and it is every Saturday. I have always a list with me on what to buy to save money and time. Thanks for a great blog post! I always love more ideas for saving money. Gosh, I wish we had Costco in Australia! I recently started adding a small amount of water to my green smoothies instead of milk and found I didn’t even notice a difference in taste! and no mention of meat/chicken /pork yay!! !